"A Southland shearer cost New Zealand a test series victory and sliced off the side of his finger, but then he went to "war" to win his final battle. Invercargill shearer Nathan Stratford said he blamed himself for New Zealand losing the fourth and final test against Wales at the Corwen Shears in North Wales on Sunday morning (New Zealand time). His nightmare shear resulted in the test series being squared 2-2, but he bounced back to give his bloody best and won the final event of the New Zealand team's six-week British tour. During the final test, Stratford hooked a flank, cutting a lamb and incurring a penalty big enough to allow the Welsh to square the series, he said. The New Zealand team were ahead until the lamb got cut, he said. Stratford also sliced the side of his finger off during the test, but carried on to compete in the 20-lamb Corwen Shears open final after a pep talk from New Zealand teammate John Kirkpatrick about the penalty. "Johnny said it happens to everyone, and he said when you go to war, you are always going to get some casualties." The New Zealand team had won all the open finals on tour, with Kirkpatrick winning five and David Fagan three, going into the final competition. Kirkpatrick said three words to Stratford before the team went up to shear: "Lets attack it". Stratford shore the 20 lambs in about 12 minutes and won the £750 (NZ$1450) first prize. "Everything sort of clicked. It was great." Shearing Sports New Zealand spokesperson Julianne Buick said she had never seen Stratford shear so fast and the atmosphere was electric." 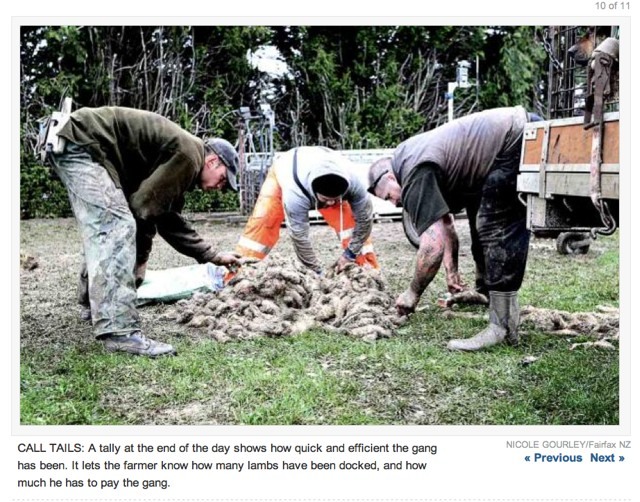 The Southland Times : "Final Battle A Win For Wounded Shearer"
Filthy looking sheep covered in dirt and their own waste, being thrown about on a wooden floor by people paid to work as quickly as possible. 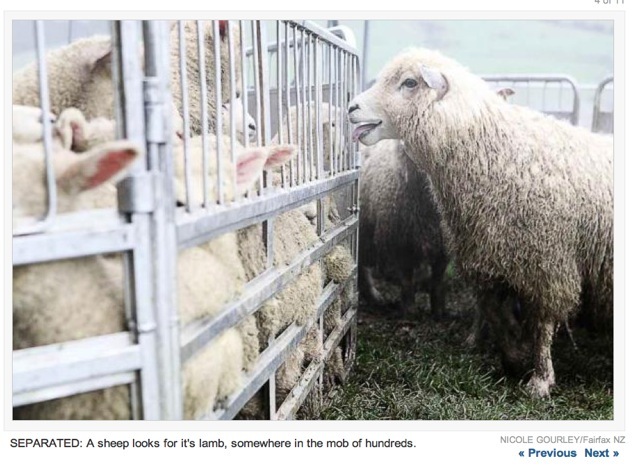 We wouldnt throw a labrador sized dog against a hard wooden floor, why would we do the same to these terrified sheep? 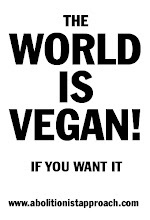 Why would we want to wear their wool? Just another one of the awful things we do to Other Animals, see my blog post listing various ways we harm other animals here. 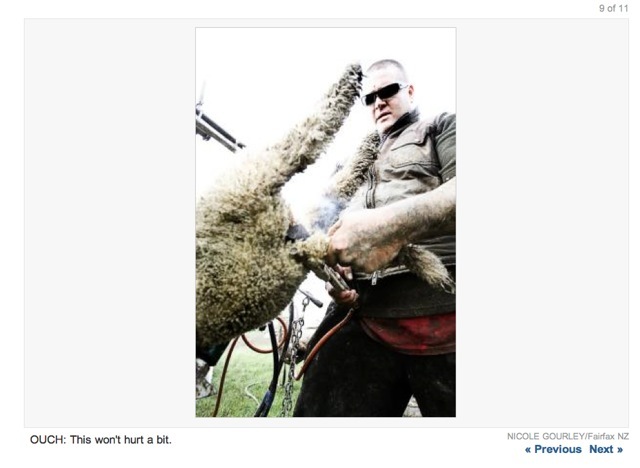 Coexisting With Nonhuman Animals : "From The Bodies of Babes"
Google image search for "sheep shearing", take your pick of the photos, they're all brutal, there is nothing nice about taking wool, taking hair from sheep. One of the most brutal examples of Non Veganism I can think of, "tailing" sheep, cutting their tails. I lost a friend who lives in the area, Ohai, where my Great Grand mother Rose Young was born due to describing the scenes as "brutal". While I wish I still had my friend, and I apologised for upsetting her, how else can you describe the scenes shown here, typical everyday animal harm, with a reporter there to show "rural Southland life". Wikipedia article briefly explaining "tailing", cutting their tails, often their testicles off to "prevent possible infection/masculine hormones which make ITS flesh taste bad"
"Southland Times photographer Nicole Gourley spent a cold October day with a tailing gang on Mt Linton Station, near Ohai in Western Southland. With a little under 60,000 lambs to get through in three weeks, the gangs work hard and fast in less-than-pleasant conditions, no stopping for morning tea! They work tirelessly, earning their wage. Nicole realised it took a tough man to work non-stop in the mud and rain, cutting pieces out of lambs' ears and soldiering on when the smell of cooked lambs tail filled the air. No matter how hard they tried to convince her, she could not be encouraged to have a turn. She'd worked out tailing was not for her." 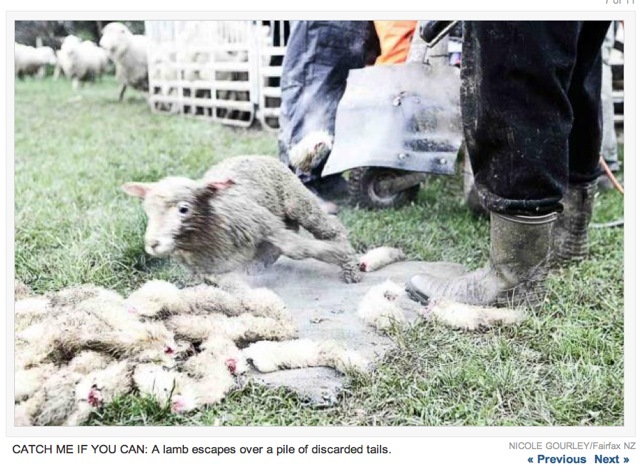 The Southland Times : "Photo Essay : Tailing Lambs: Lamb Chops" graphic, brutal photos. "...how quick and efficient the gang has been...how much he has to pay the gang..."